My kids don’t do transitions well. I know this, and sometimes it still surprises me. During a still-early fall hallway conversation with Tween’s then-2nd grade teacher, she commented that Tween didn’t seem to be taking school seriously. Without missing a beat I responded, “Give him until Thanksgiving and he’ll be great!” She looked at me cross-eyed, as if I had given the most ridiculous answer. Maybe I had, but time proved me right. What should surprise me is how little I recognize that I don’t do transitions well. Summer is more than half flown, we’re only weeks from the start of a new school year, and I haven’t yet settled into the rhythm of this season. And it’s about to change, another transition. I can’t help comparing this summer to last. Apples to oranges but, as I want to continue to learn the lessons packed into our two-month Costa Rica sabbatical, I keep checking our blog to see what we were experiencing and learning last year. Leisurely mornings, adventure-filled days, and extended togetherness… Costa Rica sunset meant Family Time to eat, talk, play games or watch movies or read aloud. Of course Teen prefers friend-time to family-time, I get it. But a year ago we were making the beach safe for sea turtles and swimming in secluded waterfalls and mugging for the camera with toucans on our shoulders, making memories. Guy and I took two weeks off for a camping vacation. And then every itinerary we discussed had some strike against it. We researched, Google-mapped, discussed, contacted friends, prayed, and persisted for hours over weeks before coming up for air with the same befuddling conclusion: we need to stay home this summer. First world problems, I know. But I’m still disappointed. So instead of adventuring out, we have ventured in to the crazy jumble of our garage to create a hang-out space for our kids and their friends. We have vision, and still I’m overwhelmed. Cleaning the garage means face-planting in All The Projects I never got around to. I shafted some straight into the trash, donated others, and shuffled some back into the house. Projects covered every surface, and a few miraculously got done. And the panic-stricken late-night realization that the cleaners were coming in the morning meant that a whole bunch of projects went, yup, back into the garage. Oy! Day 3 we went to work, because that’s what happens when you work at a church and don’t leave town. To be honest, I’ve worked every day of what was supposed to be our vacation, because we are not on vacation, and I mostly work from home anyway. Sigh. 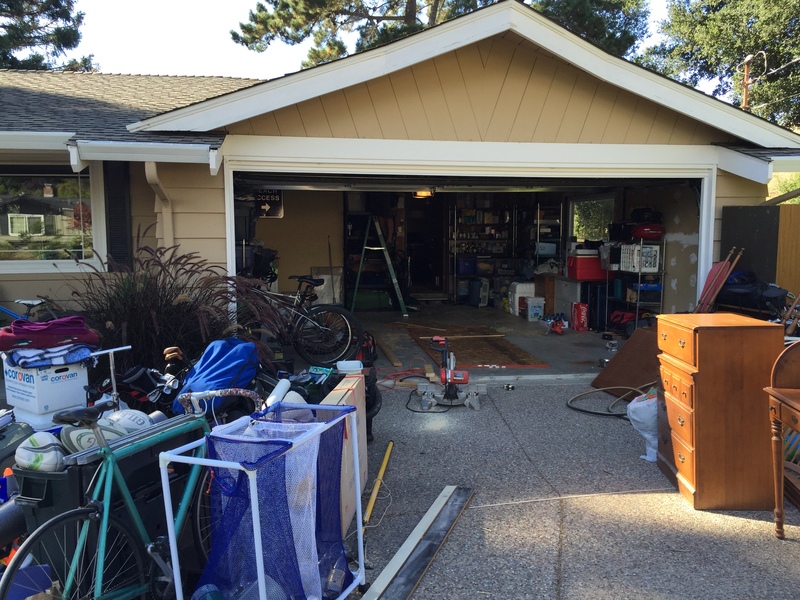 The garage is jumbled but better. I am jumbled, and a discipline of gratitude will make me better. Step 1. For one week try to be aware of your tendency to criticize, to see what is missing, to focus on what is not there and comment on it. Try instead to focus on what is right. Notice what you have and others contribute. Search for things to praise. Begin with simple things. Praise the world. Appreciate your own breathing, the sunrise, the beauty of a rainstorm, the wonder in your child’s eyes. Utter some silent words of thanksgiving for these small wonders in your day. This will begin to change your focus on the negative. Step 2. Give at least one genuine, heartfelt praise to your spouse [or child, neighbor, whoever] each day for an entire week… extend the exercise one more day. Then add another day…. When you meet someone new, look for what is special about this person. Appreciate these qualities. Remember, this all has to be genuine and heartfelt. Don’t be phony… Tell people what you notice and genuinely appreciate about them. So I will refuse to criticize this summer, to see what is missing. I will be grateful for the progress we’ve made, the project we’ve undertaken. I will search for bright moments (Teen offered to help me do his laundry – progress!) and offer generous praise. And eventually the garage will be clean, and I will be grateful. Do you know what it is to feel the light of love inside you? He took me to the coast, this Guy who knows and loves me well. Teen and Tween are at Scout camp this week. Both kids, same camp, all week long – miss them but, woo hoo! Guy didn’t need to book a Mendocino ocean-front B&B. We could have enjoyed our very own quiet house. We could’ve made happy progress on cleaning out the garage or finally sprucing up the backyard (seriously, we’re stoked on these projects). We could have made dinner together and rented a DVD, or gone out to dinner and a movie sans kid-consideration. But he knows that the sun-streaked blue-and-tan view of ocean-meets-sand, the salty-musky beach smell, the crash-and-slick of waves, the salt-sticky whip of my hair in sea-breeze and crunch of sand between my toes, they heal my little cracks and fill me up with peace, with joy. As we dashed out the door I grabbed a new-to-me book: John Gottman’s The Seven Principles for Making Marriage Work. Recommended to me by friends, I’ll say this: if you are married, go right now and order this book! I’d read the first four chapters on my own, but each of the seven principles chapters includes exercises to do/discuss. As Guy drove I peppered him with questions – some we answered about each other (“I think the current stressors in your life are…”) and others we answered for ourselves (“I am most proud of xyz accomplishments in my life”). We talked about childhood and adulthood, life before and after marriage and kids, our worries and joys and hopes. We laughed and reminisced and got serious on things that matter. Talk about checking in with each other, whew, this was Marriage Intensive 101 and, thank-God-hallelujah, 20+ years of marriage and we still pass with beautiful flying colors. About an hour into the almost four-hour drive, we stopped at Russian River Brewing Co, my brother’s favorite and a place we’d never been. The gal seated next to me at the bar instantly struck up conversation and I’m so glad she did! While we sipped and waited for food, this East Coast darling confessed that she and her husband travel to California at least once a year for their favorite beer. The chatter wound leisurely this way and that, surprising in its ease, and we happily exchanged contact info before we departed. At last we checked in at the Sandpiper House Inn in Elk, California. Our host Craig pointed us to our room and back out to the beach, where we delightedly drenched ourselves in late afternoon sun. As we walked north to beach end, and then south again, stepping over and around the bull kelp curlicuing the beach, we thought we heard music, maybe horns. 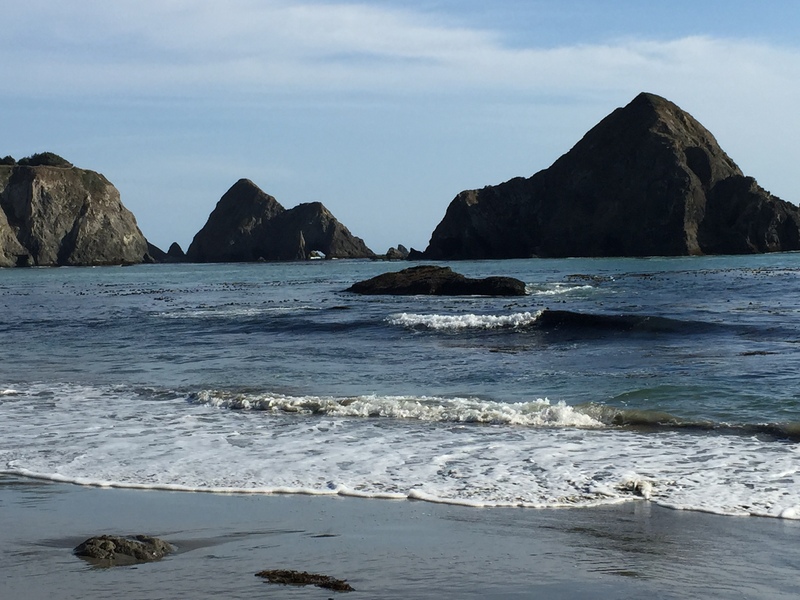 Until we spotted a trio of young adults, two men and a woman, who had industriously turned the bull kelp into musical instruments, like shofars calling us to our beach-side Sabbath rest. 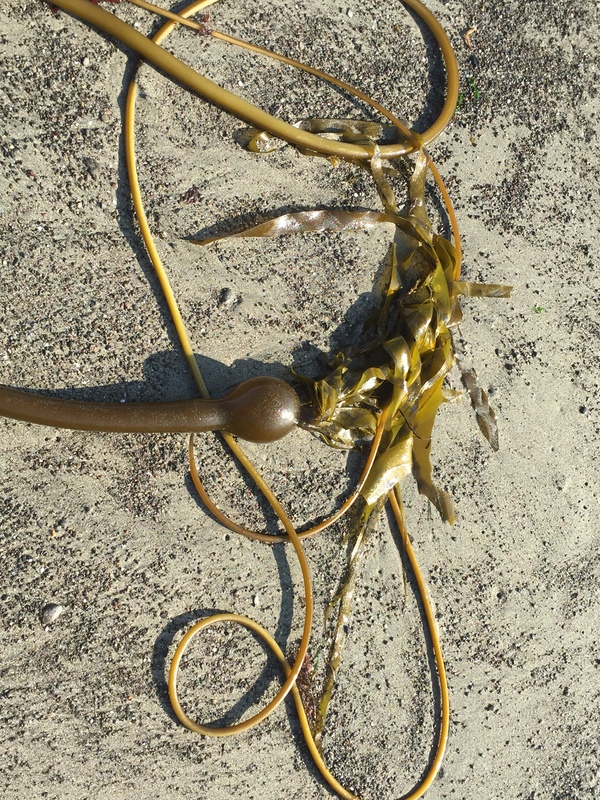 Later we saw them kelp-jump-roping – Sabbath is also laughter and fun. Dinner: we talked with Craig, scanned the local paper, drove through heritage-town Mendo, and finally landed at The Ravens, a vegan restaurant at The Stanford Inn (no kidding, spooky-populated with a conspiracy of ravens as we drove in). If you like veggie/vegan food, this restaurant is for you. If you think you don’t, won’t, never will like veggie/vegan food, this restaurant is a MUST! Oh. My. Word! The ceviche might be the most surprising bite we’ve ever eaten – so tangy-tequila tasty, crafted from cauliflower and mushrooms instead of seafood. And the warm bread served with cauliflower-basil-cilantro “butter” – mouth watering. This will go down in our history as a milestone meal. I awoke early to glorious light, sun-on-water on the Most Amazing View reflecting on pale-blue-turned-bright-white wallpaper. Guy slept in. He never sleeps in, a testament to restorative sea air, a comfortable bed, and his need to unwind. I soaked in the view. Gradually the fog crawled its way across the water, dampened the light, and I got up. Early coffee service and, wouldn’t you know it?, the Inn had one of our very own 20+-years-of-marriage china tea cups which I filled chock-to-the-brim with hot, black coffee. We walked down to the cliffs, pausing to pet the twin Tabby rescue cats (one of which was hell-bent on guarding a gopher hole), admiring hummingbirds buzzing amidst garden along the path. Craig made a crazy-good breakfast of French toast with blueberries, accompanied by classic 70’s rock. We chatted with another Bay Area couple as we watched Turkey Vultures soaring over the cliffs. Did you know that, unlike most birds, Turkey Vultures have a keen sense of smell and can smell fresh carrion up to a mile away? Google over breakfast – sometimes a good thing. As for me, I put away my phone. I didn’t check email or social media for two days; I even resisted the temptation to review iPhone pictures lest I feel “the need” to post immediately. I’ve realized that, half-over, I’m not as relaxed as I’d hoped to be this summer. I’ve cut back my at-work schedule but frittered away too much in-between time on social media and nonsense instead of intention. I want to be Present, capital P on Purpose. 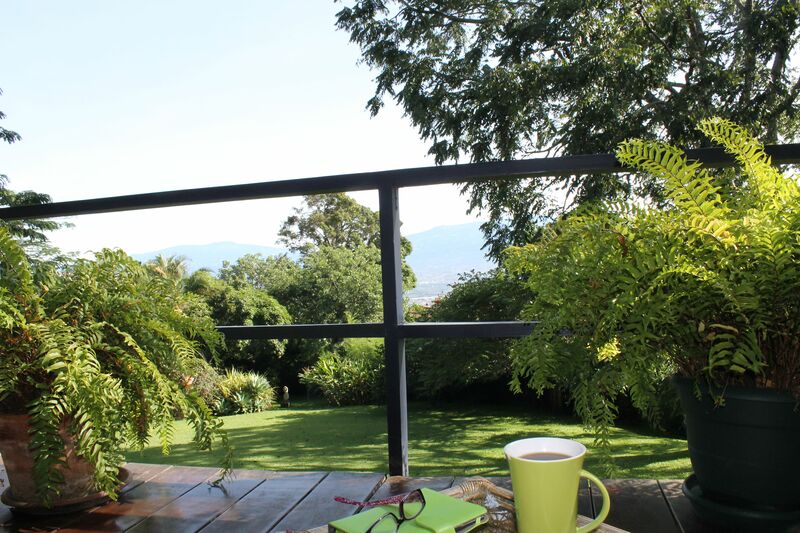 Last summer in Costa Rica, new culture + shock, we had little choice but to live purposefully hour-to-hour, day-to-day. This summer, at-home-“usual,” it’s easy to let moments slip, let days slide into nothing-done, nothing-gained. Sometimes a surprise is the *shock* one needs to reflect, remember, restore. We hiked along foggy Point Arena, so mist-covered we couldn’t see the newly-named National Monument lighthouse and closest California point to Hawaii. Lanky golden grass shivered in the sea breeze, as did we. 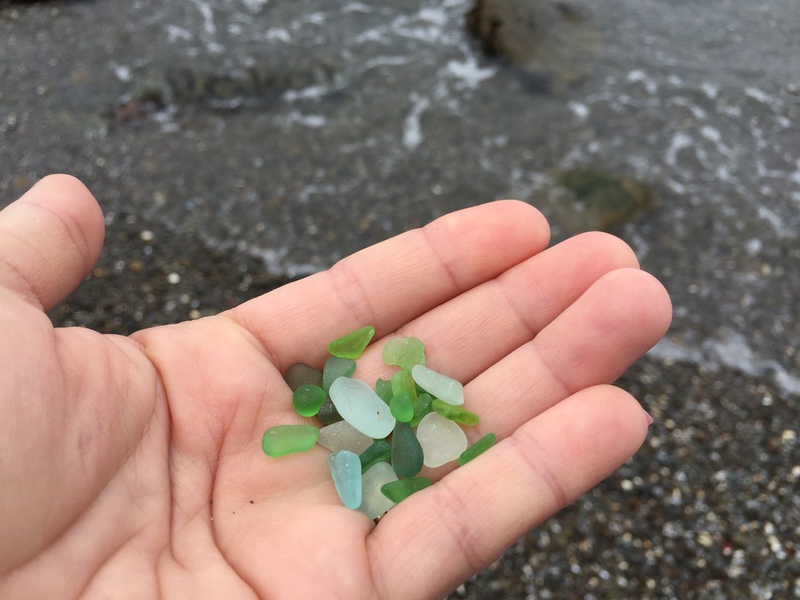 We drove north to Fort Bragg and dug deep in a festival of sea glass. We grabbed a quick sandwich lunch and headed home, our only regret that our getaway ended too soon. We could have stayed home. Instead we created memories. Guy made the better choice, and we are better for it. Thank you, my love!